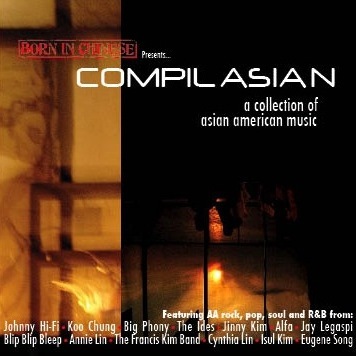 CompilAsian is, simply put, a collection of Asian American music. As a music lover, I am proud to call many of these artists my friends. As an Asian American musician, I am honored to call them all my colleagues. I hope you enjoy listening to this compilation as much as I have enjoyed making it. And please, if any of these songs move you in any way, reach out to the artists, buy their CDs, tell all your friends about them… or just blast the music really loud from your stereo. These artists originate from around the country and the music spans rock, pop, R&B, acoustic, and singer-songwriter genres. From the alternative power-pop of Johnny Hi-Fi and the synth rock of Blip Blip Bleep, to the jazz infused vocal stylings of Cynthia Lin and the indie acoustic sounds of Big Phony, CompilAsian represents a sampling of the incredible talent that the Asian American music community has to offer. This collection has something for everyone. 50/50 – Wondering where the money from sales of CompilAsian goes? Well, unlike some record labels, profits from sales of CompilAsian are split 50/50 with the artists. In the interest of serving both the label and the artists fairly and equitably, half of the profits go to Born In Chinese, while the other half are distributed evenly among the artists. We at Born In Chinese are here to promote the artists, not cheat them! Many thanks to: David Purcell, Kyler, Adam, Peter, Chris and Jane for helping me make this possible!